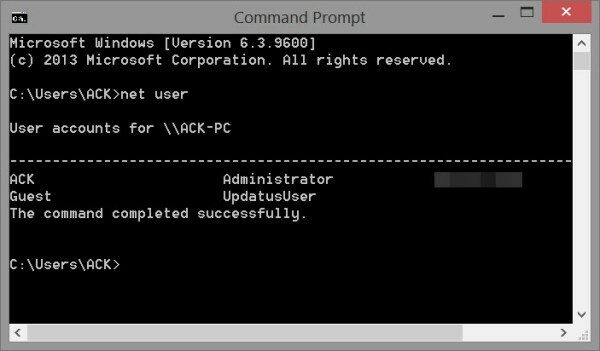 You can use the net user command to create and modify user accounts on computers. When you use this command without command-line switches, the user accounts for the computer are listed. The user account information is stored in the user accounts database. This command works only on servers. To run the net user command tool, using the WinX menu, open the command prompt, type net user and hit Enter. This will show you the user accounts on the computer. Thus, when you use net user without parameters, it displays a list of the user accounts on the computer. List Details on a user account. This will provide the following information on the user. usernameis the name of the user account you want to add, delete, modify, or view. passwordwill assign or change a password for the user’s account. *will produce a prompt for the password. /domainperforms the operation on the primary domain controller of the current domain on computers running Windows NT which are members of a Windows NT Server domain. /addwill add a user account to the user accounts database. /deletewill delete a user account from the user accounts database. You will be asked to type a password for the user. Type the new password and later again retype the password to confirm. The password will now be changed. This can be used if you need to enable the default administrator account. Ping returns IPv6 Address, ping IPv4?